As monsoon season looms around the west coast of Peninsular Malaysia, it’s just the best time to stay indoors and lay comatose in front of a screen and passively consume what’s showing in front of you. … Or does it have to be so? On November 30, about 30 of us leave our dusty cities and worries behind and drove up to Kin Tick Orchard Village — a resort with several stone house surrounded by a vast canvas of mountains and greens with a shallow creek that goes between the car park where all our cars are to be left behind and the resort itself. Temporary escape from the urban life. Check. And what’s were we all have in common? 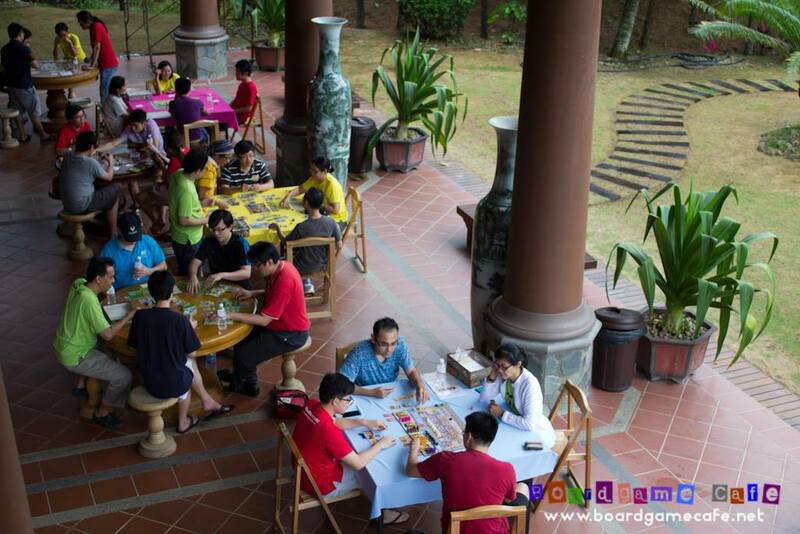 We all share our love for board games and we were there to indulge in our hobbies and play games to our hearts content — enjoying the fresh air, beautiful scenery and most importantly the company of new friends we just knew. 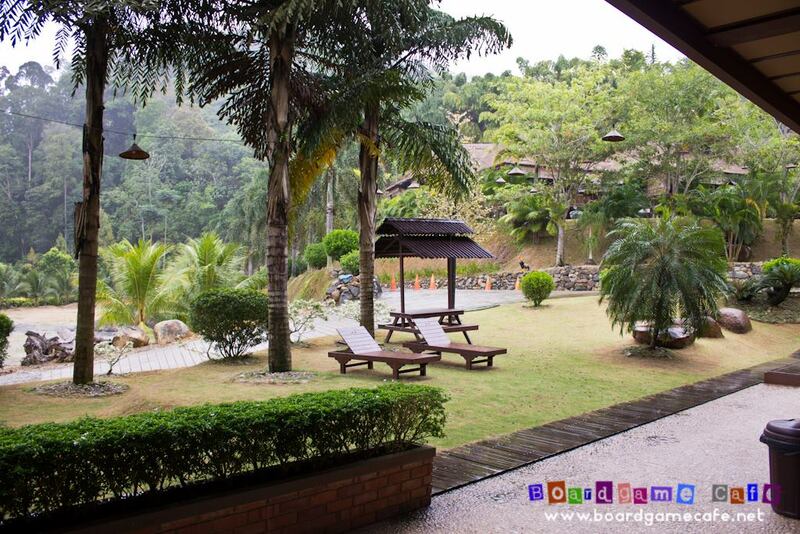 There’s no lack of other activities to keep us refreshed in between games — hiking up a hill, lounge outdoors and take in the gorgeous scenery or just sing your heart out on their karaoke machine. So many things to do, so many activities, laughter and stories to share and there’s never a dull moment while we were there :). Of course the main highlight of the day is of course, games! Tons of board games! 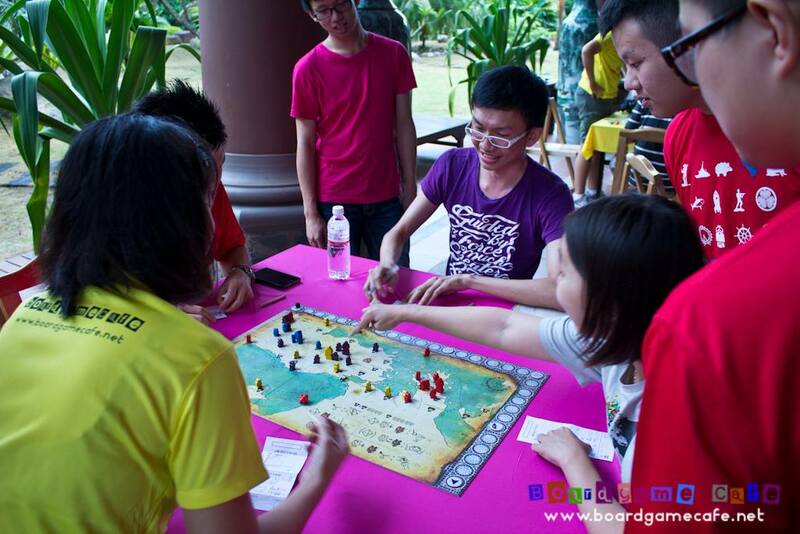 ðŸ˜„ During the retreat, all of us are part of a tournament that spans over five games: one to seed the teams, four more to gain dominance, reach for the crown and declare victorious — ultimately winning a really cool prize. Each table are seated in fours and the moment the games start there’s always the excitement of exploring a brand new game that we haven’t played before, looking forward for a great time while the competitive spirit brews within our subconscious aiming for the prize. Ultimately I didn’t win anything, but I’m here to share my first impression of all the games that I’ve play during the retreat itself — let me just walk you through my whole experience in being part of a tournament and let’s enjoy the ride together. Game 0 is the seeding round where all participants are playing short party or dexterity games to determine where players are seated. In Gotta Go!, we are all a scheming bunch of friends sharing the same buffet meal but all of us wanting to slither our way out as soon as possible to get away with not paying the meal — leaving the slowest reacting player to deal with a nasty bill, hang his/her head to shame and curse on all the friends of questionable character (well, while not being self-aware about the fact). 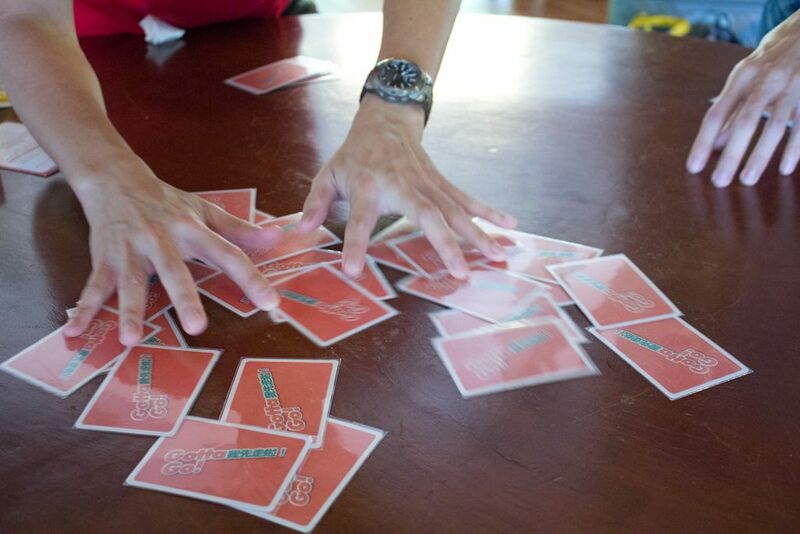 In this game, the objective is to frantically flip over cards, starting from your own face down pile of cards and then to the central pool, to collect a buffet of unique types of food and drinks and swiping away the “Gotta Go!” card before everyone does and when the time is right — if you manage to find it in the first place. What make this game a total laughter fest is in the scoring — You’ll be scored based on the number of cards that you manage to collect. But beware, all the food and drinks on the cards must be unique and there must not be any duplicates of any item or you’ll get zero points for the round. And as much as speed is the key, you also have to be really sharp in determining what card to keep in your collection. Easily said than done, of course, as the flurry of madness and hands that goes around the table hunting down cards like vultures scavenging for scraps, someone would inadvertently would make the careless mistake when the time runs out as the Gotta Go! cards get picked out one by one, dwindling in numbers and you’ll panic knowing that you may lose that very last card to the player next to you if you acted slow. It is quite a light and involved filler game and best enjoyed in large numbers (up to 10, in fact), the novelty factor may wear off pretty fast if you feast too much on this buffet of action. Kicking things off is a game about travelling around Africa, taking part in expeditions and trying to be the first to reach various destinations. And along the way you can also look through the Book of Adventures to get a pick up adventures to embark on in order to recruit helpers to help you in your expeditions or collect artefacts that are located there. This is one of the game that is often compared to Ticket To Ride and I personally consider it to be Ticket To Ride Plus. Instead of hidden personal objectives in Ticket to Ride, you have a common set of expedition which all players can plan for and compete against. And anyone is always rewarded with cards or coins by moving to the starting location of an expedition and declare commitment to complete it — and only the first person reaching the destination would claim victories points and coins for completing the expedition. And as your movement action, you can play as many movement cards as you want gives you the exhilaration of being rewarded for careful planning and achieving multiple expedition and adventures in one turn. In the end, points are mostly awarded by the amount of expedition that you have completed and sets of artefacts that you have collected, which you can score points either by collecting them in multiples of a single type, or sets of artefacts of different types. The whole “who gets there first” to claim the expedition card makes every single turn a very engaging experience as you bite your nails hoping that someone else didn’t claim the card you wanted before you execute your perfect card combo in your hands. And while the competition can be strong, you are already rewarded the moment you commit to a expedition and the game constantly presents you with great options as you navigate through Africa. I love the game and it’s a game that is fun to both beginners and advanced players. Byzantio is a hidden objective area control game of which you control your faction and making sure you control the support of the cities that would help you to ascend the imperial throne. At the beginning of the game, each of the players will be jotting down seven cities, each from different provinces, as their secret objectives of the cities that the player would vow to control. Cities are being assigned to reducing amount of points, which gives the player some indication of their own priorities. The map will be seeded with a Pretender to the Throne on fixed locations of the board. The game would proceed in 31 rounds, and every player are granted six different actions with an equal limit of each action being available in the game in aiding the player to wrestle control over cities: campaign, muster, negotiate, advance, bribe and expel. And by hook and eventually by crook, players would have to cross paths, negotiate and take cities through force. And at the same time trying to conceal their actions so not to reveal what the cities of their top-most priority are. Throughout the course of the game, there will be events that would affect the lands of Byzantio — mostly to wreck havoc over cities, killing your own men or losing control over cities. At the end of turn 31, players will be scored for every city that they controlled the cities that they have written down as their objectives. Every player is given one chance to guess the top priority city of other players — and bonus points will be awarded to every correct guess. The game comes with two sides of the board and I made the mistake of using the Nekken set-up rules (i.e. the other side of the board) of asking everyone to jot down five cities instead of seven. We didn’t know about the rule of requiring players to jot down only one objective city for every province, hence some of the cities does get a bit clumped together as our objectives. In the event of actions that required a dice roll (i.e. failed negotiation, bribe and expel action), we misinterpreted the whole modifier rule in the event of either player has a pretender in the city. In the actual written rules, the successful rolls are written with the modifiers being applied to it (i.e. 4-8/5-8), instead we interpreted the rules as if the modifiers have not been applied (i.e. 3-8/6-8). This really causes some overpowered situation of having the Pretender in the city and discourage players from actively taking over cities guarded by Pretenders and bringing their Pretenders along and crush the opponents. Would highly recommend that the unofficial note sheet from BoardGameGeek is to be used for the game, which uses a scaled down version of the map to jot down priorities. We ended the first day of our tournament with a economic game — and we shall set sail to the sea, haul some fish home to be sold and participate in… carry trades for salt? What to expect when you are trying to build a shipping empire after all. In the game, each player has the chance of taking one of the four actions: City action to buy saline or building, Navigation action to travel to the ocean or back, Harbor action to build a ship or move goods to the ship, or Market action to buy or sell from the market. However, any action taken by one player would be made expensive for subsequent activation of that said action. Now, coming back to the salt carry trade joke I did just now, one interesting portion of the game is that the victory point track also doubles as a means of tracking the amount of money that you have. On top of that, you are allowed to overdraw yourself into debt and you’ll be charged interest for it. It may sound like a bad idea on the outset, but in fact exploiting the debt facilities is a very valid strategy of winning the game by exploiting known arbitrage opportunities. Think salt trade is boring? Think again. Being an economic game, it’s all about understanding all the actions and building benefits and figuring out how to weave them perfectly to form your money making engine, while making sure that you react to every single move your competitors are doing. The whole game is a constant tug of war between planning ahead and making adjustments to react and counter any sneaky advances. This has to be one of the greatest surprises in this retreat that what appears to be so dry and complicated from a glance of the board and components can be so engaging and involved. Throughout the whole game, the game grips me into actually taking note of what other people are doing in the game and constantly be frustrated of executing one action too late as actions becomes more expensive in the game. There’s never a time where I think I can just rest my laurels and focus on what I’m doing only. If there’s one big caveat, it would be that first time players the sheer number of buildings and actions can be quite overwhelming and it does confuse us all as to how the abilities of each building relate to one another at first glance. Once everyone understands the game, it is one of the best gaming experiences I have and I highly recommend that you check this gem out. It’s after 8 and after a sumptuous dinner and belting songs with new found friends with karaoke, it’s back to some games again. All of us feel burnt-out by the long strategy game fest, so why not indulge in some lighter games instead? And so we started of with the latest coolness — The Resistance: Coup. Coup is a game of bluffing and deception, you’ll have two officials in front of you of which you have influence to, and you need to make sure that you are the last player standing by removing all influences from other players. There are five types of officials in the game and each of them have their own power: Duke can take three coins and block foreign aid, Assassin can remove one influence/official of another player after paying three coins, Contessa blocks assasination attempts, Captain takes two coins from another player and blocks coins from being stolen from them and the Ambassador to swap out your officials. It is also possible to gain coins via an Income action (get 1 coin) or a Foreign Aid action (get two coin), or just launch an unblockable avalanche of a Coup which forces one player to lose one influence by paying up the seven coins. So choosing what action to take on your turn is really critical. But there’s a twist! All influence cards in front of you is laid face down, and when you choose to take a character action on your turn, you can totally bluff your way into taking the character’s action — even if you don’t have the corresponding character. So within the three rounds of games, all 6 of us are trying our best to keep poker face, happily declare that we are Dukes and grab three coins from the table — only to find out that half of the table is claiming to be Dukes and we have nary a clue who’s bluffing. Super fast-paced, simple to teach rules and one game that keeps the table thrash talking during the game even with new friends (which is one of the issues that I encountered with The Resistance). Solid game and I like it :). Ah~ Bang — the game that some love it, some hate it and some thread really carefully. The original card game is well known for its fun-filled crazy chaos while bullets get shots around unless you happen to be one of those players who gets eliminated way too early and have to endure the long dragged out game. And now we have the dice game version of it — seems to be one of those resurging trends these days, you know, the whole let’s turn an existing property into a dice game trend. If you haven’t played Bang before, at the start the game, every player will be dealt a hidden identity and a character card — after that, the player who has the sheriff identity card will have to reveal himself and the game starts. Objective of the game? Players who are outlaws wants the sheriff dead, the sheriff and his unknown deputy wants the outlaws dead and the renegade wants to be the last person standing and deal the finishing blow of the game on the sheriff. Each player will be a character, which will dictate the HP and the special ability of the player. On every turn, every player will have the opportunity to roll five dice up to three dice, Yahtzee style, to form combinations in order to achieve the effects that he/she wanted. Getting a bullseye with 1 or 2 on it will allow you to shoot your neighbours up to the range dictated by the number on the dice, a beer mug will heal you one HP, arrows would cause you to take arrow wounds that could potentially reduce your HP later in the game as you are being ambushed by natives (though the good news is that you can reroll them). Being able to get three Gattling gears would trigger a carnage of dealing 1HP damage to every single player and taking away all arrows off you. And finally the dreaded dynamite symbols which you aren’t able to reroll them and if you are unfortunate enough to roll three of them, you’ll have to end you turn and you’ll have to take one wound (curses!). 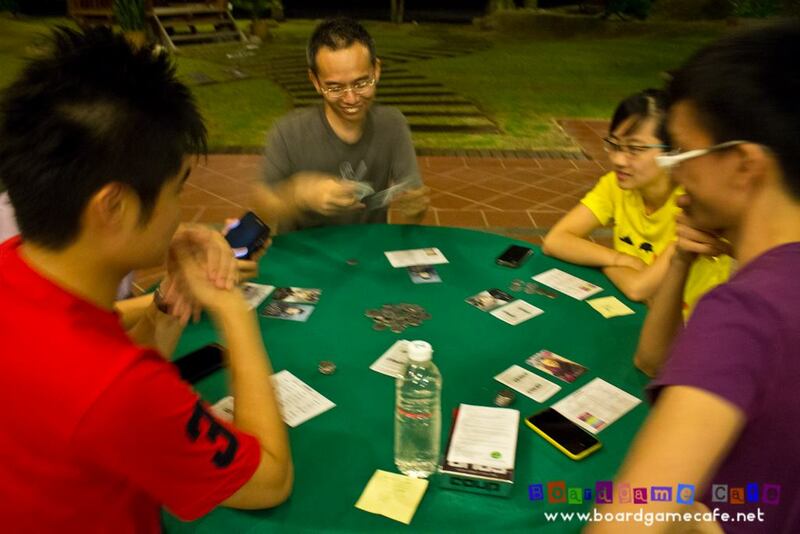 This is one really face-paced, easy-to-teach game that really brings a riot to the group. There is player elimination in the game, but even as a passive participant, seeing all the accusations and player interaction and the reaction of other players on every dice rolls are just too entertaining to watch and be a part of. The best way to explain how great the game was is to describe how one of our game ended. In that game, the last outlaw of the game is being gunned down and what we have thought to be the outlaw all along turns out to be a renegade all along — and the sheriff is so badly wounded down to 2 HP while the renegade is almost at full health. This proceeds to a really tense shootout between the two, but in a twist of fate, the table has turned and the sheriff had quite a few lucky rolls that levels the playing field. Our table has gathered quite an audience at this point and the cheering goes on. As the renegade makes his final roll, an arrow is rolled and… the game ends with a draw as both the sheriff and renegade are both being shot down by natives. And everyone just burst in laughter in the hilarity of all this and that what makes a party game truly magical. After a full night’s rest, we are then up to the last game of the tournament (well, though more like we are forced to end the tournament with this game as we ran out of time). So we ended the game with Kickstarter game from Dice Hate Me games, Compounded. In Compounded, we are chemist trying to build chemical compounds and trying to be the top chemist either by getting the most atomic points or the fastest to build up his/her workbench. On every turn, each player would draw elements out of the bag and this would determine what chemical compounds you can complete. Each time, there’ll be 16 compound cards that will be laid on the table which you are allowed to build — each of them having their own victory points, upgrades to your workbench, events and special bonus that will be rewarded for completing that compound. 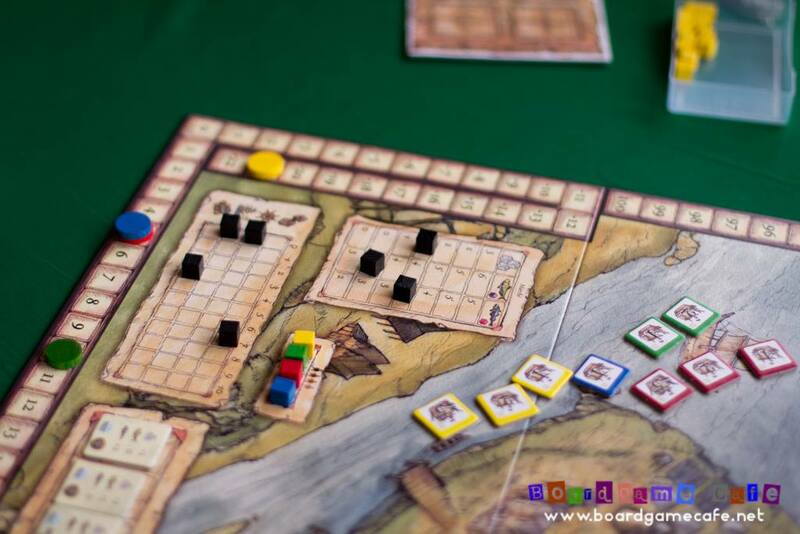 The interesting part of the game is that after the elements has been drawn, each player will have the opportunity to lay claim and focus to “study” on a particular compound that is on the table. And that card will be locked down to that player and no other player can claim the rewards upon its completion. And following that you are allowed to place a limited amount of elements from your workbench to the compounds on the table, hopefully you can complete them in your turn. As you claim rewards, you also receive upgrades to your work bench to allow you to draw more elements from the bag every turn, have more focus study tokens to be placed on the compound table, increasing the number of elements you can place on the compounds or increase your element storage space. The game is fairly easy to teach and grasp, game play-wise it is quite similar to Settlers of Catan where resource management and player negotiation is key in winning. The key of winning in the game is negotiation and asking for help, as you’ll always find yourself not having the elements that you need, enough research capacity to place elements in one turn, or both. In order for players to progress quickly, it’s more likely you wanted to strike partnership with other players to help you in completing your research — there are even a special Grant rewards which allows a player to grant a workbench upgrade to other players, further encouraging player interaction. However, in my personal opinion, apart from the whole nerdy appeal of doing chemistry in a game and solid mechanics, I personally find it pretty dry and it can be pretty tough if a player doesn’t have an advantage in negotiation, which can be quite critical if you consider the breakdown of the chemical components you can draw per turn. But it’s really more like a “not my kind of game” kind of thing than anything, and I’d say it’s a step up from base Settlers of Catan and the advance variants in Compounded seems like one that I’d want to try in the future. Once the prize giving ceremony is finished and the event is officially announced to have ended, I’ve to admit that at that time I’m slightly disappointed by the fact that I don’t get to play any big Essen releases of the year, as it seemed that only the top tiered tables get to play them. But luckily Ken Yen came along and ask do we want to stay back a while longer to play Concordia. 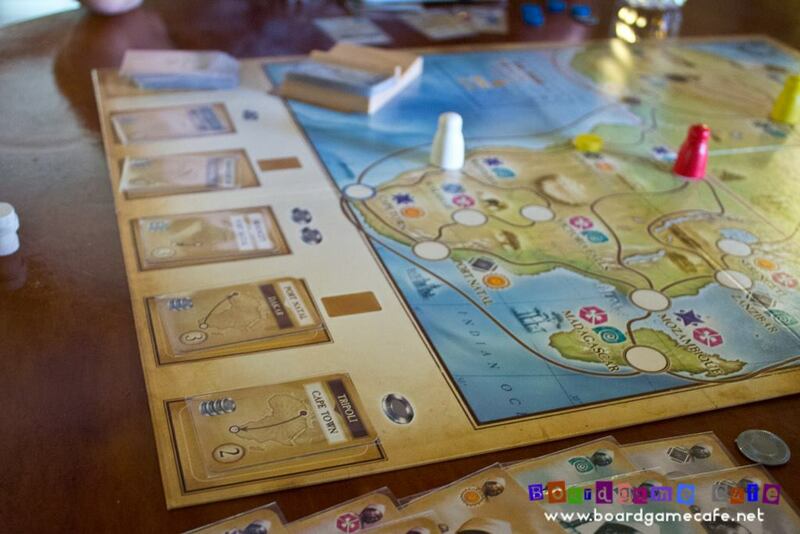 Concordia is a peaceful strategy game of economic development in Roman times. With all players starting from the centre of the board with one land colonist and a sea colonist, all of us would sprawl around the map trying to discover new land and colonise it. Each player will start off with the same seven personality cards — and these cards would actually dictate what actions we can take by playing the card. So essentially this game is all about hand management, on every turn, each player will get to choose one of the cards from their hand and execute its effect. Action will range from moving your colonist to build new settlements, collecting resources from your settlements, buying new personality cards to add in your hand, trading in the market etc. The strategic component in the game being that once you use up a card, the action cannot be taken unless you play a Tribune card later in your turn, which allows you to recover all your used personality cards but at the same time you’ll generate income based on the number of cards that you have played previously. So planning ahead and knowing how to chain your action combos before the other players snag at whatever that you are eyeing on (which happens frustratingly more often than you think, in a good, competitive way). Now, this is one of those games that seems deceptively simple to teach yet players won’t be able to really notice the consequences of their decisions and you’d have lots of “OK, what am I supposed to do again?” moments. This is because Concordia is a victory point salad game where every single thing in the game will contribute to your final VP score. And what makes the competition even more biting is that these personality cards also acts as victory points multipliers for a particular scoring aspect of the game, from the value of goods you stored in your storehouse, every house you have laid down, each province you occupy, number of colonists you have, etc. And until this reality sinks in your brain, everything would seem really abstract and you just don’t know how well you do in the game until the game ends. I can’t express how much I adore this game — once all the players knows what goes on in the game and the brains starts ticking, one amazing race would have begun. The whole hand-management aspect is brilliant as you decide on what to want to do next and, more importantly, what card to purchase into your hand to make it as powerful an engine as you can make it to be. It’s a constant battle of managing resource and timing, I would find myself always watching what other players are doing — trying to figure out ways to counter, exploit and most of the time patching up all the blunders that I have done the previous turn. The competitive tension is always be there because until the end of the game, you can only guesstimate what the dominant focus and strategy the other players are on to. And wow, what a great way to close out my BGC Retreat experience.